Rhodiola rosea is a legendary adaptogenic tonifier that comes from the polar Arctic regions of Eastern Siberia. Among traditional people there, it is highly valued as a strengthening tonic to increase physical and mental stamina. Full Spectru Rhodiola Rosea combines an extract standardized to 0.8% salidrosides and 0.8% rosavin with a whole root extract, in order to provide the broadest spectrum of rhodiola constituents. Lifestyle Recommendations: Avoid excessive stress, eat regularly scheduled meals, get adequate rest, and exercise regularly. Other Planetary Herbals tonifiers and adaptogens include: Reishi Mushoom supreme, Schizandra Adrenal Support, Eluthero Fluid Extract, and Ginseng Revitalizer. 2 tablets twice daily, between meals, or as recommended by your health care professional. other ingredients:dibasic calcium phosphate, sorbitol, stearic acid, colloidal silicon dioxide, modified cellulose gum and magnesium stearate. 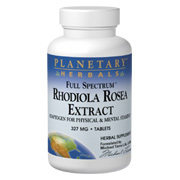 Full Spectrum Rhodiola Rosea Extract - is shipped in a discrete, unmarked package. Orders are processed immediately and usually take about 3 to 5 working days to be received. We do ask that you try it for 2 to 3 weeks to feel the full effects. Any information received is used only for order processing and shipping purposes. Your information, such as e-mail address, will never be disclosed to a third party.